The Legend of Boggy Creek was an important movie to me when I was growing up in the 1970’s Honestly, it scared the willies out of me. Since then I’ve watched the film dozens of times, including at a screening in Texarkana when we were filming an episode of Finding Bigfoot based on the local sightings. I suppose it was because of my special relationship that I chose Boggy Creek Monster to be the first movie to watch made by Seth Breedlove and his Small Town Monsters production team. The reader should probably know that I have a love/hate relationship with bigfoot documentaries. I have a special place in my heart for those that I watched growing up. Many modern documentaries seem to lack something in my mind. Perhaps it’s the familiar format of talking heads and recreations. Maybe it’s that they lack actual evidence and analysis and instead rely on eyewitness testimony. Maybe it’s just that I worked on a television show for eight years and the magic is gone in my eyes. I don’t know. Whatever the case, it’s hard for me to get excited about watching bigfoot television anymore. However, after being gently heckled by Seth about not having any of his films on my list of recommended documentaries, I decided to do my friend a solid and start watching his films. I’m glad I did. Boggy Creek Monster is a deep dive into the events surrounding the film, The Legend of Boggy Creek. Hosted and narrated by the only person qualified for the job, Lyle Blackburn, the film has information and access to locations and evidence that had never been presented in this format. In case the reader is unaware, Lyle write the book, The Beast of Boggy Creek, which documents the sighting reports in the movie, as well as the bigfoot activity in the area before and after the film was made. He has done a masterful job digging into the bigfoot history and current activity in the Fouke, AR area, and has endeared himself to the community, giving him access to never-before-heard accounts. I was pleased to find a plethora of historical documents and images in Boggy Creek Monster. The photographs of the famous footprints through the bean field were some I had never seen. Actual locations from The Legend of Boggy Creek where actual bigfoot encounters occurred were shown in the film, bringing them to life in a way that no still photograph could. Speaking of those footprints through the bean field, most researchers have deep doubts about their authenticity due to there being only three toes visible in the cast. While I also have my doubts, there is an outside chance they could be real. I find that the vast majority of bigfoot enthusiasts and even researchers don’t have a good grasp on the flexibility of the sasquatch foot. I have numerous casts in my collection in which not all five digits registered in the ground. Three is a bit strange, but it’s possible. Unless deformed or injured, the animal would have five digits, but if the sasquatch favored the inside (or outside) of its foot as it walked, it is possible that such prints could result. I still suspect they are likely a hoax because of the uproar of events in the area, but I thought this point was worth mentioning. The film featured footage of Smokey Crabtree, author and default patriarch of the Boggy Creek legend. I did not meet Smokey before he died, though I wish I had. He was feeling ill when we were filming the Finding Bigfoot episode in the area and was unable to get together, but I did have the opportunity to meet numerous other Crabtrees in the area. Let me tell you, there are a lot of Crabtrees in the area. It was no shock to me that there is a body of water nearby named Crabtree Lake. Doyle Holmes, one of the witnesses we worked with on Finding Bigfoot, was featured in the film as well. He retold the story we featured in our episode, but he also had the opportunity to recount his second sighting as well, which our editors chose not to include in the Finding Bigfoot episode. The second sighting was interesting in that he observed a juvenile, supporting the idea that the Mercer Bayou is a rich enough habitat to support a breeding population of sasquatches. Doyle’s 2004 cast got some screen time as well. 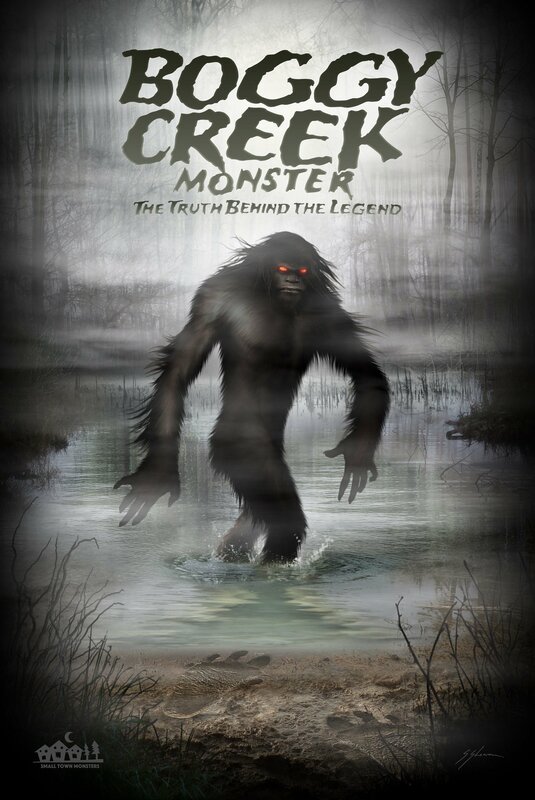 I really enjoyed Boggy Creek Monster and was happy I took the time to watch it. I certainly enjoyed it enough to get over my bigfoot-documentary bias and take the plunge into some of the other documentaries Seth and his team have made. More reviews will be coming! Besides, I owed it to Seth. I made friends with the man before I watched any of his works. Apparently, I have some catching up to do. Disclaimer: Some of the links in this post lead you straight to Amazon where you can purchase something or other. I might get a small commission if you do buy something. However, I wouldn’t link to it unless I thought it was cool and I already had one in my collection.